Rhine was born Louisa Ella Weckesser on an island in the Niagara River, New York on November 9, 1891. Her parents were Christian Weckesser, a gardener, orchardist, and farmer, and Ella Weckesser. The oldest of nine children, Rhine grew up in northern Ohio. Influenced by her father’s interest in plants, Rhine chose to study plant physiology. She attended the College of Wooster before obtaining her Bachelor of Science, Master of Science, and Ph.D., all in Botany, from the University of Chicago. After serving as a research fellow in plant physiology at the Boyce Institute for Plant Research in Yonkers, New York, Rhine moved to Morganton, West Virginia, where both she and her husband taught at West Virginia University. While there, she and her husband became interested in parapsychology, and left to train with Dr. Walter Franklin Prince of the Boston Society of Psychic Research from 1926-1927. The following year, they moved to Durham, North Carolina, where her husband had been recruited to the faculty to work under William McDougall at Duke University to help launch the university’s parapsychology department. In 1928, Rhine stopped working after she and her husband adopted a son, Robert. Through the American Association of University Women, Rhine and Mary Octavine Thompson Cowper of Durham founded the Durham Nursery School, which was the first nursery school created for children of working women. Additionally, Rhine worked with other Durham women to form the Durham Chapter of the League of Women Voters, and she pushed a bookmobile as a Gray Lady at Camp Butner during World War II.In 1948, Rhine returned to academia, and she began to work part-time at the parapsychology lab, where she took over a project of reading and responding to letters from people who had heard about the lab’s work. This work led to her full-time focus on case studies of psychic experiences. She analyzed thousands of real-life experiences from the letters people sent to her, and she laid the groundwork for their classification. Rhine, Louisa E. (1961). Hidden Channels of the Mind. New York: W. Sloane Associates. Rhine, Louisa E. (1966). Manual for Introductory Experiments in Parapsychology. Durham, NC: Institute for Parapsychology. Rhine, Louisa E. (1970). Mind Over Matter: Psychokinesis. New York: Macmillan. Rhine, Louisa E. (1975). Psi, What is it? : The Story of ESP and PK (1st ed.). New York: Harper & Row. ISBN 9780060668266. Rhine, Louisa E. (1981). The Invisible Picture: A Study of Psychic Experiences. Jefferson, NC: McFarland. ISBN 9780899500157. Rhine, Louisa E. (1983). Something Hidden. Jefferson, N.C.: McFarland. ISBN 9780899500829. ^ Rao, K.R. (March 1983). 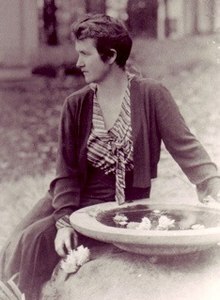 "Louisa E. Rhine, 1891-1983". The Journal of Parapsychology. ^ Hodges, Betty (15 February 1987). "Rao Volume on Dr. Louisa Rhine Reflects 'Courage of a Pioneer, Caution of a Pro'". Durham Morning Herald. ^ a b Stovall, Melinda (18 March 1983). "Mrs. Rhine dies at 91". Herald Sun. Durham, NC. ^ a b c d Dunn, Mamie (19 January 1975). "She Devotes Lifework to Psychic Mysteries". Durham Morning Herald. ^ a b "Guide to the Louisa E. Rhine Papers, 1890-1983". Duke University Libraries. 1987. Retrieved 29 March 2016. ^ Stovall, Melinda (18 March 1983). "Mrs. Rhine dies at 91". Durham Sun.